Join us May 31st at 6pm in Coconut Grove! Sunday May 31st, the South Florida community is invited to attend a candlelight vigil and silent march in memory of Lilly Aramburo, a young mother missing from Miami since 2007. Beginning at 6pm (Eastern time), Lilly Aramburo’s mother, Lucely will lead the crowd in a Justice for Lilly silent march in front of the house it is believed Lily may have lost her life. The purpose of the silent demonstration is to grab the public’s attention for a short time on the two year anniversary of Lilly’s disappearance to make everyone aware that Lilly is still missing, and we are still looking for answers. There are many missing persons in South Florida and thousands across the country. We are remembering them and their families on this occasion. Anyone with a missing loved one is urged to attend the event and bring a photo or flyer to share. Family and friends will peacefully deliver a powerful message to Miami Dade Police Department that Lilly deserves justice, she deserves to be found. Lilly has not been forgotten by her family and friends and she shouldn’t be forgotten by the community where she lived. We’d like to see Miami Dade Police take meaningful action. 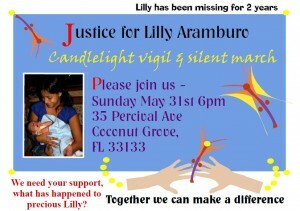 Please show your support by joining Lilly’s family and friends as we hit the streets to demand JUSTICE FOR LILLY! I realize few of you live in the Miami area, if you are unable to be there in person, we ask you to have Lilly in your thoughts and prayers while the vigil is going on. Please join us in spirit by lighting a candle for Lily (where ever you are). But to those who live in South Florida, we’d love the chance to see you in person to thank you for your support and commitment to finding Lilly these past 2 years. Although it will be a very hard day for all of us, spending it together will help us heal in a small way. Lilly Aramburo, Social Media and How YOU can Help! We depend on social networking sites to assist in raising awareness for Lilly Aramburo and missing people. If you have a loved one that’s missing, or if you’d like to help the cause, please join this Missing Persons group on Flickr. The group is focused on missing persons in the United States. Every member is encouraged to upload pictures of missing loved ones (as long as they disappeared within the US). This is a good idea for several aspects. Many people use Flickr and it’s a very effective way of raising awareness for the missing. Please join us in the Missing Persons Friendfeed Room. Members post links to pictures, articles, anything that has to do with missing people (Amber Alerts, abductions, kidnapping, runaways, etc). If you’re a social media lover, be sure to join us on various sites across the web like Care2.com and Mixx.com. Please add Missing Lilly Aramburo as a friend on myspace and join her cause on Facebook. These are just a few things you can do to help. This is one of my absolute favorite pictures of Lilly (above). It’s how I remember my friend. Smiling, laughing, enjoying LIFE. Since Lilly’s disappearance, on June 1, 2007, life has not been the same. Lily’s mother lives in constant agony, waiting for news about her daughter. It’s not easy having to raise her grandson under such difficult circumstances . With each day, Lilly’s son (now 2 years old) slowly loses precious memories of his mother. He was only 9 months old, last time he was held in her warm and loving embrace. With every new picture, sadness tends to overcome me. And all I’m left with are questions. After all this time, I believe her little boy and family, deserve answers. She absolutely did NOT willingly walk away from her son and her life. She’d never allow so much time to pass without a phone call or checking in on her son. Someone took her from us. And many of us will not rest until she is brought back home and justice is served for Lilly Aramburo. You can help by making a quick phone call to the US Attorney’s Office at 305-530-7679. It appears the US Attorneys office are the only ones who can properly investigate this case. Also, please continue sending emails to Governor Charlie Crist and media. It makes no sense that after all this time, not ONE article has been written about Lilly’s case in local newspapers like The Miami Herald or her picture displayed by local news channels. It’s not due to lack of effort, I testify to that. Someone out there knows what happened to Lilly. I urge you to contact the detective or call the tip line at 305-471-TIPS. You can remain anonymous if need be. Just pick up the phone and make the phone call, please! No matter how small a detail, no matter how silly you think it may be, your information could help solve this mystery. It’s been hell for Lilly’s family and friends. Please help bring Lilly back home. Immediately contact MDPD at 305-418-7245 or call the tip line at 305-471-TIPS, if you know anything at all about Lilly Aramburo’s disappearance. Here’s a direct statement to her perpetrator, YOUR CONSCIOUS MUST BE KILLING YOU! Please keep Lilly Aramburo and her family in your prayers.